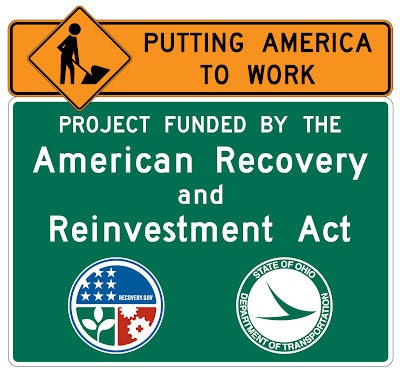 The American Recovery and Reinvestment Act (ARRA) has been criticized for not injecting the necessary amounts of money into the economy quickly enough. The stimulus package is meant to do exactly that, stimulate the economy, and thus far even the proponents of said stimulus package have been frustrated by the slow activity so far. Luckily things may be starting to change as it appears that the money is starting to flow into the Cincinnati region. Yesterday at Mayor Mallory’s press conference regarding rail transit in Cincinnati and the budget, he announced that the City received $13.5 million from the ARRA for the Cincinnati Police Department – something Mayor Mallory says could save around 50 police officers from being cut. Another $3.4 million will be going to Hamilton County to rehire 15 road patrol deputies that were laid off earlier this year. Then today Steve Driehaus (D, OH-1) announced that the Southwest Ohio Regional Transit Authority (SORTA) which runs the Metro bus system will be receiving an $823,000 grant that will be used to purchase 3 forty-foot replacement biodiesel buses. Driehaus then sent out a later press release that announced the U.S. Department of Health and Human Services has awarded just over $2 million to the Cincinnati Children’s Hospital Medical Center through the Recovery Act. The $2+ million will go towards biomedical research and research training at the Uptown hospital. All three seem to be good uses for the stimulus money as they are directly creating or preserving jobs. So what’s next for the Cincinnati region? The Public Library of Cincinnati and Hamilton County is currently going through some issues as the state threatens funding cuts. The streetcar would not only create engineering and construction jobs in the Cincinnati area, but it would also help spur additional economic development that would come as a result of the streetcar. The announcement of a new rail transit system in the Midwest might even spur the creation of a new manufacturing facility to produce the rolling stock needed for such rail projects. What’s on your list?